When Joan and Joe Truxler picked up the wiry plastic fuses and cardboard scraps from the sandy shores of Zephyr Cove’s Marla Bay, they didn’t realize the detritus would land them in the center of a firestorm of controversy. It was July 6, 2013, and what they were finding was debris from one of South Lake Tahoe’s most cherished events, the Fourth of July fireworks. The couple returned home after the holiday to find a note pinned to their door warning of unexploded mortars on the nearby beach. It was their 3-year-old grandson who found the first bit of debris. For days, Joan scoured the area, eventually filling up their dining room table with the sulfurous smelling garbage. “We realized this was a real problem and it needed to be addressed,” Joan says. It often takes a messy situation to inform a positive solution. The fight over the fireworks debris would eventually lead to a strengthened cleanup procedure, but not before things got ugly. When the Truxlers filed a lawsuit in September, alleging the South Shore fireworks were violating the Clean Water Act, it was obvious there would be a dirty fight ahead. Though they never intended to end the fireworks show, the couple says they had good reason to be concerned. Throughout the summer, they’d found more than 60 square feet of the plastic caps, cardboard chunks and wiry fuses—some emblazoned with the name of the show’s pyrotechnic contractor, Pyro Spectaculars—on the beach near their home. Pyro Spectaculars is one of largest pyrotechnic companies in the world. It produces shows for the Super Bowl, the Olympics and cities like Seattle. 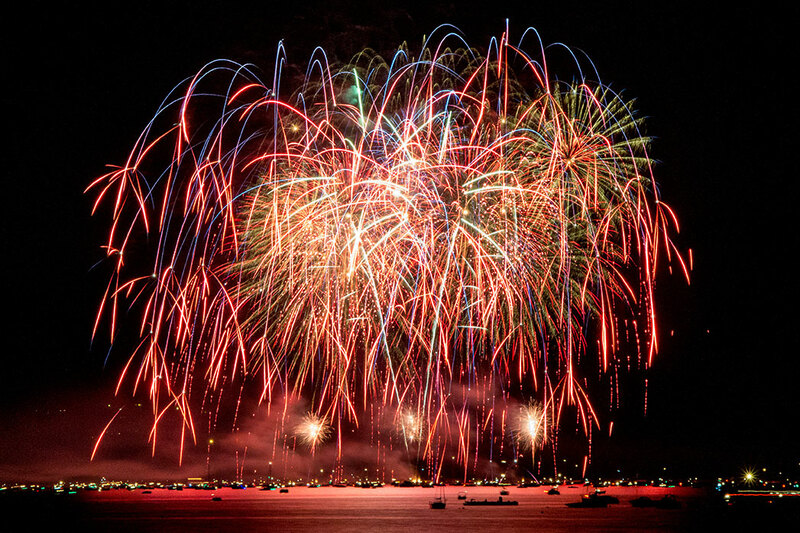 Contracted by the Lake Tahoe Visitors Authority (LTVA), it has produced many of the shows during South Lake Tahoe’s 30-year history with fireworks. The company does boat and diver sweeps after both its Fourth of July and Labor Day shows. Last year, company employees picked up hundreds of pounds of trash, much of it unrelated to pyrotechnics. With dozens of shows under the company belt, there have been few complaints of fireworks debris. It’s not certain what went wrong last year. After weeks of picking up debris after both the Fourth of July and Labor Day shows, Joan was fed up. She’d reported her findings repeatedly to TRPA and received little response. No one from any Tahoe agency had come out to see the garbage. The Truxlers contacted Michael Lozeau, a well-known Bay Area environmental attorney, in mid-September. Notice of intent to sue went out later that month. After a tough 2013–14 winter, South Lake Tahoe’s businesses were looking forward to a busy summer. When word spread that the fireworks shows were in jeopardy, business owners saw a threat to both their livelihood and an event many of them cared deeply about. When the first round of settlement talks failed, LTVA started to weigh its options. The board called an emergency meeting in late March. Dozens spoke out against the lawsuit and urged LTVA to continue the show. California State Senator Ted Gaines (R–Roseville) accused the Truxlers of attacking American tradition. In the end, the board members voted to cancel their support of the fireworks unless a settlement could be reached within one week. Later that evening, someone handed out the Truxlers’ contact information and address. The LTVA vehemently denies having any part of the personal attacks on the Truxlers. The couple received threats via phone and email and staff at their housing complex had to ward off trespassers. Their homeowners association hired an armed security guard. The couple made the decision to leave town. The settlement talks moved to Sacramento. Behind closed doors, the Truxlers, LTVA, Pyro Spectaculars Inc. and the Tahoe Douglas Fire Protection District were able to develop a settlement. A new cleanup procedure was established. There’s also a renewed enthusiasm from the community. “Everybody wants to work together at this point to keep the event, but also to make sure it’s safe for the environment and The Lake,” says Eric Guevin, a spokesman for the Tahoe Douglas Fire Protection District, which will now handle the fireworks permitting and cleanup process. Still, Chaplin believes the solution could’ve been reached without litigation. The Truxlers are eager to see how the Independence Day show turns out and what the days following bring.